Based on the strength of the bank’s balance sheet, the Asian Banker Magazine has named the Bank of Ceylon as the country’s strongest and the largest bank and to be among the 500 Largest and Strongest Banks in the Asia Pacific region. The Asian Banker 500 ranking is the most comprehensive annual evaluation that captures the quality and sustainability of the balance sheets of the banks in the region. All data are sourced from Central Banks and miscellaneous publications or via informed estimates. The evaluation was based on the balance sheet growth, scale of operations, risk profile, profitability, asset quality and liquidity for the stipulated year. The announcement was made at CIBOS- the SWIFT global payment provider, ceremony held at the in Sydney Australia. The list of 500 Strongest Banks in the Asia Pacific region named by the Asian Banker is topped by Bank of China (Hong Kong) and includes International Banking Giants in the industry such as Hang Seng Bank, HSBC, OCBC Bank, Citi Bank (Hong Kong), Commonwealth Bank of Australia, ANZ Bank of New Zealand and many others. “With this latest ranking BOC has set an unparalleled benchmark in the Sri Lankan banking industry as the Strongest and Largest Bank in the country, which stands along with other banking giants in the Asia Pacific region. This title was once given for the Bank of Ceylon in 2015 also by the Asian Banker. We are proud not only on part of the bank but also on part of the country’s economic profile for uplifting the Sri Lankan banking industry in the international arena. 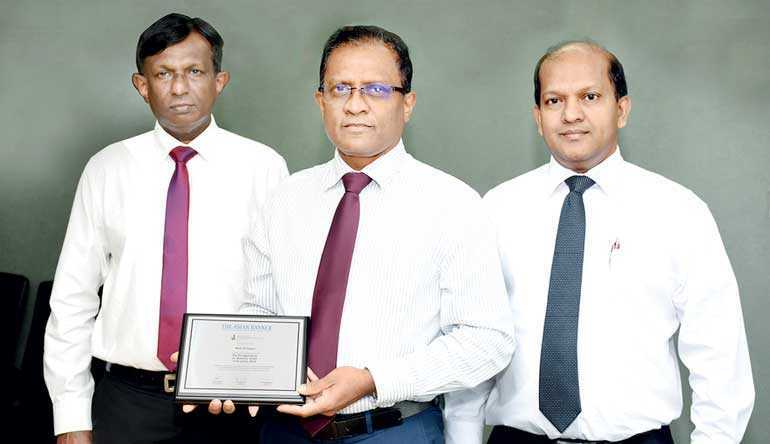 I must say we are further encouraged by this achievement to serve our customers and all our stakeholders with exceptional care and commitment to enrich their achievements,” said CEO/General Manager Senarath Bandara stated. Over years the bank has increased its overall balance sheet strength with strong improvements in profitability, capitalisation and liquidity. Owning the highest asset base in the country, BOC closed the year 2017 on an exceptionally high note on the balance sheet. The Asian Banker has been publishing this annual ranking since 2007 to highlight best performing banks in the Asia-pacific region based on the strength of the balance sheet. The Bank of Ceylon has surpassed Rs. 1 trillion in assets, Rs. 1 trillion in deposit base and Rs. 1 trillion in loans and advances which counts a triplet of trillions in the balance sheet. Throughout its existence the bank has been one of the major driving forces behind uplifting the country’s economic profile. BOC has been the highest profit earning single Sri Lankan business entity in the country since 2015. As for 2017 Profit Before Tax (PBT) was Rs. 30.3 billion, an unprecedented 22.8% revenue growth from 2016. For a number of years Bank of Ceylon has been the holder of the largest asset base held by any single entity in the country. This position has been further strengthened as the loans and advances figure has reached Rs. 1.2 trillion and in doing so has pushed the assets base to Rs. 2 trillion by the time of writing. This is a year-on-year growth of 17% in 2017. The loans and advances have accounted for nearly 60% of the bank’s total assets with the gross loans and advances recording 16% growth YoY in 2017. The bank’s Return on Average Assets (ROAA) ratio stood at 1.7% and Return on Average Equity (ROAE) ratio stood at 20.9% portraying the bank’s ability to generate healthy returns for the owners despite the increased assets base over the period. Consequent to the previous year the bank’s domestic liquid asset ratio was at a moderate level of 27.2% as of end 2017, standing much above the Central Bank’s required benchmark of 20%. The off-shore liquid asset ratio was at 21.9% against the required benchmark indicating stability in foreign currency liquid assets of the bank. The bank managed to maintain a better trade-off between liquidity and interest earning assets. The bank also continued to sustain the Capital Adequacy Ratio (CAR) by maintaining the total capital of Tier I and II at 14.6% level against the Central Bank’s minimum requirements of 11.75% according to the BASEL III capital requirements which came into effect from 1 July 2017. During the year the bank received Rs. 5 billion capital infusion from the treasury strengthening the bank’s capital base to Rs. 20 billion.